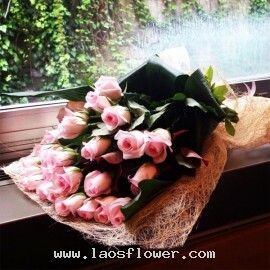 30 roses, It is perfect for giving as a gift to people who reach the age of thirty years old. 30 roses, no special meaning. It is a perfect number to someone's mind. It is perfect for giving as a gift to people who reach the age of thirty years old. 30 pink roses bouquet accent with leaves. Wrapped in pink natural fibers and tied with pink ribbon. This bouquet is perfect for a birthday gift. Perfect 30th birthday gifts or anniversary gifts. Congratulations on graduation day. The color of roses can be changed, such as red, white, yellow, orange,..
30 red roses arranged round shape in a clear glass vase. We will add a beautiful ribbon. The color of the roses can be changed the way you like. Occasionally, substitutions may be necessary to create your bouquet due to the availability of certain flowers in various parts of the country. Substitu..
A bouquet of 30 long-stemmed red roses arrange in round shape accent with eucalyptus leaves. Wrapped with red mesh and red ribbon. The color of roses, wrapping, and ribbon can be replaced with the color that you like. Occasionally, substitutions may be necessary to create your bouquet due to the ..
30 white roses bouquet open to show on one sided. 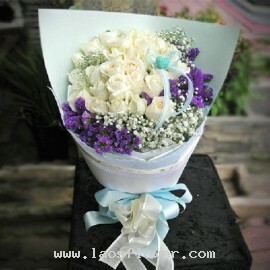 Use white roses arranged next to each other accent with white gypsophila and purple statice flowers. Decorated with a small blue ribbon. Wrapped with light paper and tied with white and blue ribbons. A beautiful bouquet is perfect for sending to your..